The Farmhouse Bed and Breakfast is a local bed and breakfast located in the Upper Peninsula, in Gladstone, Michigan. Their previous site design was not mobile-friendly and used eight-year-old design methods which are no longer recommended. In addition, the website didn’t convey the aesthetic the owner wanted. For their site redesign, I worked with The Farmhouse’s graphic designer to create a mobile-friendly, usable, and quick to download website. Additional pages were added to promote local businesses and workshops. View The Farmhouse Bed and Breakfast website. Custom WordPress development, responsive design, mobile-friendly design. Plugin audit, photo optimization, and design customization. Greenlawn Landscape Management is a local landscaping and lawn services company located in Kimball, Michigan. Their previous site design had not been updated in six years, used outdated design and development methods, and used stock photography to showcase services. For their site redesign, I created a mobile-friendly, easy to navigate website design using current design and development methods. The menu was streamlined, content re-written, and photos from Greenlawn were used throughout the site. View the Greenlawn Landscape Management website. Custom WordPress design and development, responsive design, mobile-friendly design. Information architecture, content audit, plugin audit, photo selection and optimization, and design customization. Canton Goodfellows is a local nonprofit organization dedicated to providing gifts and clothing to Canton, Michigan children in need during Christmas time. Their previous site was two pages of content, entirely text, which had little visual interest for website visitors to explore further. For their site redesign, we wanted to make sure the Canton Goodfellows site was responsive, accessible, easy to navigate, and had an attractive design. View the Canton Goodfellows website. Migration from self-hosted WordPress site to customized site hosted on WordPress.com. Information architecture, content audit, content writing, photo selection and optimization, design customization, and email consulting. K & N Automotive’s redesigned responsive website launched in 2015. An independent full-service Saab auto repair shop for 35 years in Ann Arbor, K & N is recognized for its honesty, integrity, and professionalism. The goals for the site were to create a mobile-friendly site with updated photos and content. View the K & N Automotive website. Copi Properties is the mobile-friendly website for an Ann Arbor college student apartment rental company. Incorporated third-party rental housing multi-list application. View the Copi Properties website. 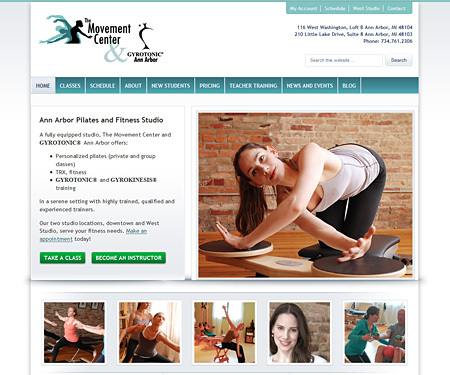 Custom development of Ann Arbor pilates website including user research, content audit, information architecture, and search engine optimization. WordPress development and third party application integration.